In the world of ideas, South Korea is king. South Korea notched top scores worldwide for manufacturing value-added as well as for tertiary efficiency — a measure that includes enrollment in higher education and the concentration of science and engineering graduates. While the country’s No. 39 ranking for productivity might pass for mediocre, it was second for R&D intensity, high-tech density and patent activity and ranked sixth for researcher concentration. While the top spot is befitting for a country that puts a lot of money toward developing new technologies and produces its fair share of the world’s engineers, the conversation in South Korea has been more about how the economy can get the bang for its buck in innovation, according to Marcus Noland, director of studies at the Washington-based Peterson Institute for International Economics, with a focus on North and South Korea. South Koreans also are aware of institutional factors that might be limiting how much they take advantage of innovative behavior, Noland said. South Korea’s almost six-point edge on No. 2 Germany — and outpacing of neighbors Japan (No. 4) and China (No. 21) — also might understate the degree of economic competition felt among those in the Asian nation. South Korea is “squeezed between low-wage China on the one hand and more technologically advanced Japan on the other, so there’s this sense of anxiety, or a certain degree of urgency, about maintaining this performance,” said Noland. Many of the same risks gripping countries outside of South Korea — sluggish growth, rising inequality, fewer full-time jobs — have made policy makers and consumers alike in even the world’s most innovative area “anxious” about the economy, he said. More recently, tumult in Chinese markets has shaken South Korea, where central bankers last week downgraded their forecasts for economic growth. Gross domestic product will expand at a 3 percent pace in 2016, down from an estimate of 3.2 percent in October, they project. The growth estimate for 2015 was cut to 2.6 percent from 2.7 percent. At the same time, an appearance anywhere in the top-50 list should give an economy something to cheer about, since it could mean a boost to longer-run growth. The world’s largest economy, the U.S., took No. 8 in the rankings. The placement for the world’s second-largest economy, China, at No. 21 in the innovation index is reasonable given its status as a developing country in which technologies are largely copied rather than created, said Bryson. The same could be said for other countries where the comparative advantage is still relatively cheap labor rather than cutting-edge technologies. The standings reflect the North-beats-South tale of the global economy: Africa, with No. 46 Tunisia and No. 48 Morocco, and Latin America, with Argentina at No. 49, are scarcely represented on the top 50 list. Six of the top 10 economies hail from Europe, and three from Asia. The ranking began with over 200 economies, from which those that didn’t report data for at least six of seven categories measured were eliminated, trimming the list to 84. 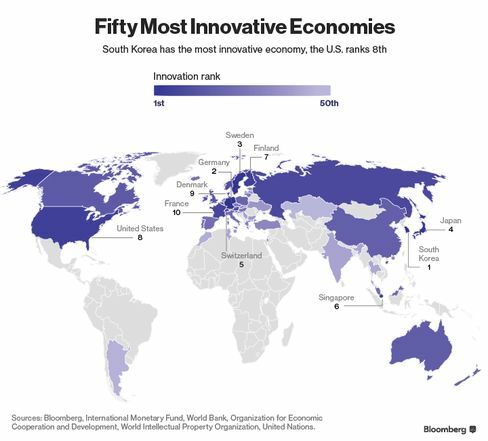 Bloomberg released overall and category scores for the top 50 innovative economies.